A carte-de-visite portrait of Captain Reginald William Sartorius (1841-1907), who received the Victoria Cross, Great Britain’s highest award for gallantry in the face of the enemy, for his bravery in 1874 during the First Anglo-Ashanti Expedition. His father was Sir George Rose Sartorius, an officer in the Royal Navy (later an Admiral of the Fleet) who saw action at the Battle of Trafalgar and was later awarded with various titles in the Portuguese nobility for his services to the Portuguese (1831-1833). Reginald, his second son, was born in Portugal on 8 May 1841. He was educated at Victoria College in Jersey and joined the Bengal infantry as an Ensign in January 1858, rising to the rank of Lieutenant the following May. He saw active service during the Indian Mutiny and later in the Bhutan Campaign. In 1868 he became a Captain, at the same time taking on the responsibilities of a squadron subaltern in one of the cavalry regiments. 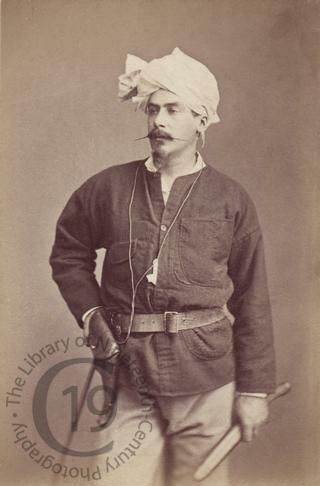 In 1873 he joined the Ashanti expedition of Captain John Hawley Glover as a Captain in the 6th Bengal Cavalry. The campaign against the Ashanti took place in the British protectorate then known as the Gold Coast (present day Ghana). It involved a local army raised by Captain Glover, an experienced administrator in West Africa, and an Imperial expedition commanded by Sir Garnet Wolseley. Sartorius was twice mentioned in dispatches and awarded the VC for an incident at Abogoo on 17 January 1874 when he rescued a wounded Hausa NCO under heavy enemy fire. The incident brought him to the attention of the British public and he was much featured in various newspapers. His photographic portraits also gained a certain currency, among them some showing him with his dog, which had accompanied him on the campaign. Partly as a result of the publicity, Sartorius was appointed to the staff of the Prince of Wales when he visited India the following year. On 30 October 1877 in Bengal he married Agnes Mary, born in India, the daughter of Dr J.G. Kemp; their marriage produced one son, who also served in the Indian army, and one daughter, who served as a nurse during the First World War. Sartorius later served in the Afghan campaign. In 1886 he became Colonel of the Bengal infantry and a Major-General in 1895, though by then his active service had ended. In 1897 he was placed on the retired list. A member of the Royal Yacht Squadron, he died suddenly on 8 August 1907 while visiting his brother Euston, also a VC winner, at Cowes on the Isle of Wight. Photographed by Maull and Company of London.